The Trump administration has put competition with China at the center of its economic policy. At the same time, it has also advocated a loosely defined plan to expand economic linkages with the Asian Pacific region called “Free and Open Indo-Pacific.” The objective is to increase US involvement in the larger regional economy through investment, security, market access, and trade. For many observers, the Trump administration’s current interest in engaging with the region is surprising, given the speed with which it withdrew from the Trans-Pacific Partnership. Moreover, some regional powers are likely doubtful of the sincerity with which the United States will pursue the new policy. If the president is serious about the Free and Open Indo-Pacific plan, one way to show his commitment would be to repeal the Jones Act. The Jones Act, passed in 1920, mandates that all shipments by water between US ports use US-owned, US-crewed, and US-built vessels. As a result, a foreign vessel cannot bring goods from Asia to both the port of Los Angeles and the port of Oakland on the same voyage. This creates challenges for shipping companies with foreign-flagged vessels to ensure their ships carry balanced cargos that keep the ship fully loaded along all parts of its voyage. To see the impacts of the Jones Act on shipping routes, as an example it is useful to examine all shipments of imports and exports between the Asian Pacific region and the San Francisco Bay Area in 2016. These trade volumes for goods crossing the pacific by ship are shown below. Almost three times more imports to the San Francisco Bay Area from Asia go through ports in the Los Angeles Area than through ports in the Bay Area. 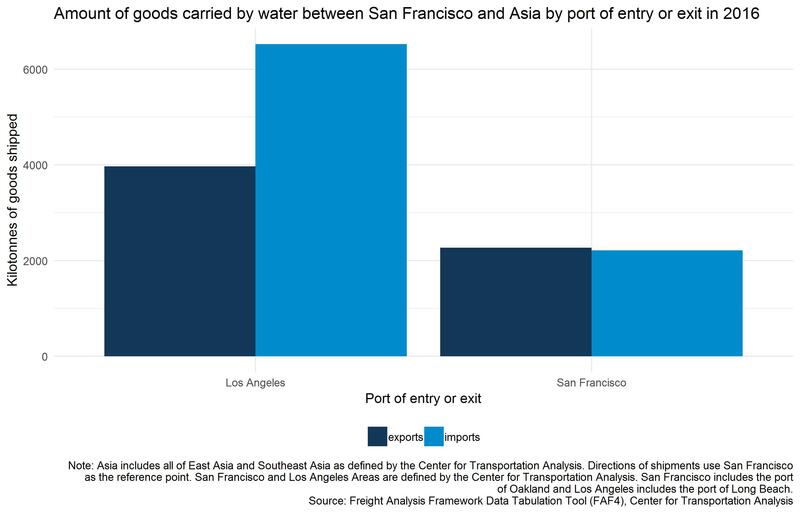 Similarly, over twice as many Bay Area goods are exported to Asia via LA ports than from Bay Area ports. The reason why so many goods intended for the Bay Area flow through the Los Angeles ports is that ships crossing the Pacific need to ensure cargo balance, which is easier to accomplish in the larger LA ports. The Jones Act clearly creates inefficiencies. 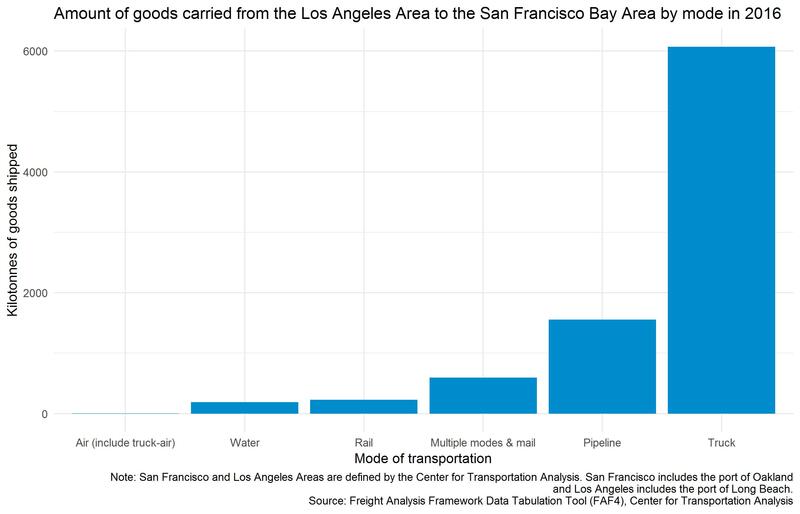 Shipping by water is significantly less expensive than shipping by rail, truck, or air. The Jones Act’s mandates make shipping costs for three quarters of the imports directed to the Bay Area significantly more expensive, especially for heavy and bulky freight. Similarly, two thirds of all exports from the Bay Area are more expensive for foreign consumers than they need to be. The only commodity shipped by boat from LA to SF is crude petroleum, a commodity that is not imported from countries in South East Asia. Even other non-perishable products better suited for ocean shipping like coal, refined fuel, and chemicals exclusively travel by truck, rail, air, or some combination of those three transportation modes between the two areas. The Jones Act adversely affects trade between the United States and the Asia-Pacific region. Its impacts are substantial and adverse for shipping companies based in Taiwan, Japan, South Korea, Singapore, Thailand, and Indonesia, which make up around 24 percent of the global market share held by the 30 largest firms. Repealing the Jones Act would allow our trading partners more shipping routes to create balanced cargo, ensuring fully loaded ships, lower prices of imports for US consumers, and perhaps even more importantly lower prices of US exports for consumers in other Asia-Pacific countries. If the Trump administration is serious about increasing good will in the Indo-Pacific and deepening economic ties between the US and its trading partners in the region, the administration should advocate the repeal of the Jones Act.